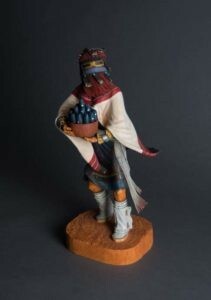 Focusing on beautiful and fascinating kachina carvings, this exhibit explores how three art-collecting couples who have been longtime Eiteljorg supporters forged friendships with Hopi artists and with each other. Together, these three collectors have given the museum what is arguably the finest collection of contemporary kachina carvings anywhere. The exhibit continues in the Eiteljorg’s Paul Gallery through Aug. 28. Every Saturday, 10 a.m.–5 p.m.
Every Sunday, 12 p.m.–5 p.m.
Every weekday, 10 a.m.–5 p.m.
At the Eiteljorg Museum their goal is to inspire an appreciation and understanding of the American West and the indigenous people of North America. Bring family, friends, or come solo to experience amazing exhibitions, collections, festivals and more!